These collectible stone bladed knives are one-of-a-kind productions. Each knife sports a hand-crafted stone blade embedded in a naturally weathered shed mule deer antler or oak branch wood. These handles have been cut to size and sanded to remove any roughness. Even with these alterations, the handles still often retain their natural colorings which were the result of environmental weathering. An epoxy resin tightly secures the blade within this handle. The blade is fairly sharp (can be either dulled or more highly sharpened by request). The edge can be used for cutting, however it should be remembered that these knives are primarily created as Collectible Art Pieces. No guarantee or warranty is given relative to usability or durability. Specific Obsidian Type can be requested but is not guaranteed available, substitutions will be made if necessary. Due to the time involved in manufacturing these items, expect a month delay before shipment. Three-Inch Obsidian Double Edged Blade embedded in a long mule deer antler handle, decorated with turkey feathers on a leather thong (blade length includes the hafted portion). You may request a particular Blade Material, and every effort will be made to fulfill your request, but no guarantee is given that your knife blade will be of the selected material. Expect a month wait before shipment. 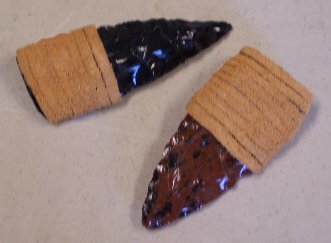 Two and One-Half Inch Obsidian or Crypto-Crystalline Silicate Double Edged Blade embedded in a short antler handle (blade length includes the hafted portion of approximately a half inch). The Handle end is decorated with a polished stone. You may request a particular Blade Material, and every effort will be made to fulfill your request, but no guarantee is given that your knife blade will be of the selected Obsidian material. Expect a month wait before shipment. Three Inch Obsidian Or Crypto-Crystalline Silicate Double Edged Blade embedded in a varnished and sanded hard wood handle (blade length includes the hafted portion). You may request a particular Blade Material, and every effort will be made to fulfill your request, but no guarantee is given that your knife blade will be of the selected Obsidian material. Expect a month wait before shipment. Two and a Half Inch Obsidian Blade embedded length-wise in a hard wood stick or antler beam handle with a leather thong carrying strap at the handle end (blade length includes the hafted portion). You may request a particular Blade Material, and every effort will be made to fulfill your request, but no guarantee is given that your knife blade will be of the selected material. Expect a month wait before shipment. Two and a Half Inch Obsidian Blade embedded length-wise in a hard wood stick or antler beam handle with a leather thong carrying strap at the handle end (blade length includes the hafted portion). Expect a month wait before shipment. Two and a Half Inch Obsidian or Flint Double Edged Blade embedded in a antler tine handle (blade length includes the hafted portion). You may request a particular Obsidian Type, and every effort will be made to fulfill your request, but no guarantee is given that your knife blade will be of the selected material. Expect a month wait before shipment. Three Inch Obsidian or Flint Double Edged Blade embedded in a antler tine handle (blade length includes the hafted portion). You may request a particular Obsidian Type, and every effort will be made to fulfill your request, but no guarantee is given that your knife blade will be of the selected material. Expect a month wait before shipment. Three Inch Single-Edged Obsidian Blade embedded in a hard wood or antler handle with a leather thong carrying strap at the handle end (blade length includes the hafted portion). You may request a particular Blade Material, and every effort will be made to fulfill your request, but no guarantee is given that your knife blade will be of the selected material. Expect a month wait before shipment. Three Inch Single-Edged Crypto-Crystalline Silicate (Chert, Flint, Agate, or Chalcedony) Blade embedded in a hard wood or antler handle with a leather thong carrying strap at the handle end (blade length includes the hafted portion). You may request a particular Blade Material, and every effort will be made to fulfill your request, but no guarantee is given that your knife blade will be of the selected material. Expect a month wait before shipment. 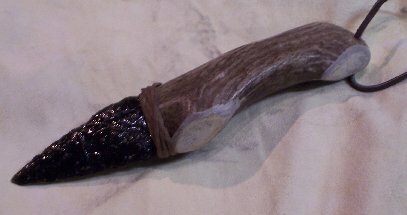 Two Inch Percussion Flaked Obsidian Blade embedded in a hard wood or antler handle with a leather thong carrying strap at the handle end (blade length includes the hafted portion). Rabbit Fur covers the hafting region. You may request a particular Blade Material, and every effort will be made to fulfill your request, but no guarantee is given that your knife blade will be of the selected material. 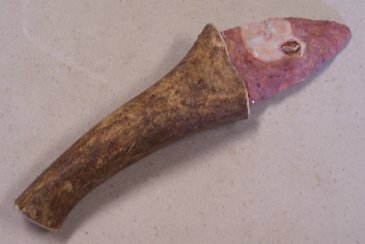 Two Inch Percussion Flaked Crypto-Crystalline Silicate (Flint, Chert, Agate, or Chalcedony) Blade embedded in a hard wood or antler handle with a leather thong carrying strap at the handle end (blade length includes the hafted portion). Expect a month wait before shipment. Three Inch Percussion Flaked Obsidian Blade embedded in a hard wood or antler handle with a leather thong carrying strap at the handle end (blade length includes the hafted portion). Rabbit Fur covers the hafting region. You may request a particular Blade Material, and every effort will be made to fulfill your request, but no guarantee is given that your knife blade will be of the selected material. Three Inch Percussion Flaked Crypto-Crystalline Silicate (Flint, Chert, Agate, or Chalcedony) Blade embedded in a hard wood or antler handle with a leather thong carrying strap at the handle end (blade length includes the hafted portion). Expect a month wait before shipment. Three to Four Inch Obsidian Or Crypto-Crystalline Silicate Biface with the bottom third wrapped with leather to form a handle. This basic knife represents one of the earliest knife forms. You may request a particular Blade Material, and every effort will be made to fulfill your request, but no guarantee is given that your knife blade will be of the selected Obsidian material. Expect a month wait before shipment. A Four to Five Inch Obsidian Biface embedded in a complete deer fore leg with hooves (blade length includes the hafted portion). You may request a particular Blade Material, and every effort will be made to fulfill your request, but no guarantee is given that your knife blade will be of the selected material. A Four to Five Inch Obsidian Biface embedded in a deer leg bone (blade length includes the hafted portion). You may request a particular Blade Material, and every effort will be made to fulfill your request, but no guarantee is given that your knife blade will be of the selected material. Both Specialty and Standard Knives have won many awards at Art Shows in California, Arizona, and Oregon.